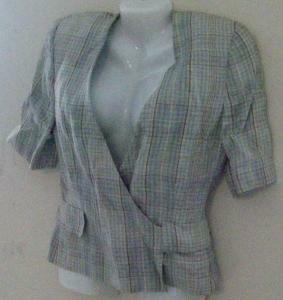 Great vintage Giorgio Armani tweedish plaid top. Perfect over slacks. Has a wrap around effect, with one loop buttoning on the lined interior, and the outer one, criss crossing across to button under the "faux" pocket flap. Has 2 belt loops under each pocket and one on the tapered back. Would look cool with a belt thru it. Has shoulder pads that feel as if they can be cut out if you'd like. Shoulder to shoulder seam: 15 1/2"
Underarm to underarm: 18 1/2"
Length mid shoulder to hem: 23 1/4"
Feel free to email me for any extra pics, etc.